Finished products. 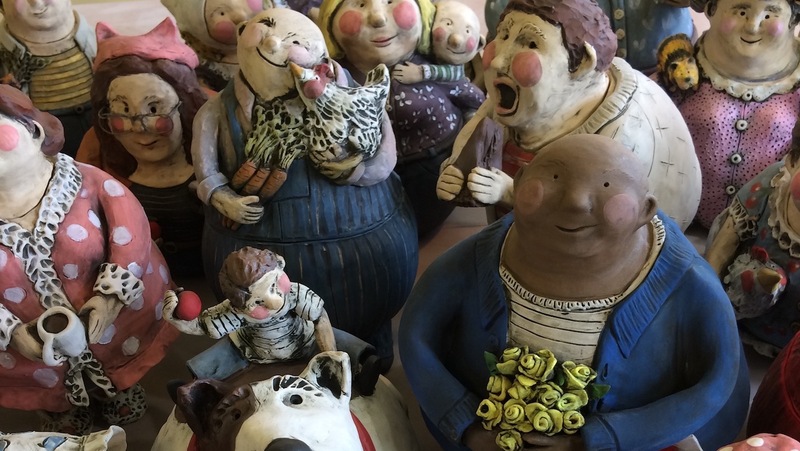 It was a 3 class process for these students to make, glaze and fire these charming pots. Making new friends! They must have a minimum 3 week dry time before they are loading into the kiln. Jenny Jorgensen plays with her food! Her sweet smile makes me happy. She was fun to create. I love the shape of her hair and her kimono. This fella is a favorite! He has more motion in his stance than I usually have in more figures. He is eating on the run. This jar was an honor to create. Inspired by family totems, the bullfrog and the dragon fly represent family members that have passed. This was a surprise Christmas gift. I hope it was well received. I love dogs! I really like to make them into whimsical jars. What a great place to store the treats! I love the days that I share my studio with young students. I am inspired with their ability to just paint without fear of judgement. They are always proud of what they have created! Inspired by a print by Alaskan artist Rie Munoz. Gemma and JoJo playing Cat’s Cradle. The little things, the little moments…they aren’t little.